The breed takes it's name from the ancient market town of Clun, situated in the beautiful Clun Valley in the southwest corner of Shropshire and near the county of Powys. The Clun Forest is a mountainous district, running to an altitude of 1,630 feet above see level. Many Clun flocks have been kept for years in those hills, while others thrive in the lower pastures of the area. Because local shepherds selected for hardy, fertile sheep, the Clun Forest became, through the centuries, a hardy and adaptable breed, able to forage and fend for itself. Some authors attribute the breed to a combination of Hill Radnor and Shropshire with Kerry Hill breeding also introduced in about 1865. The Cluns were among those breeds that became economical to produce following an agricultural depression in Britain, beginning in the 1870s, when the price of sheep collapsed, the bottom fell out of the grain market, and lands were left to return to grass. Such breeds had merit in part because of their ability to survive in a rigorous environment, on grass and whatever they could forage through the seasons, and still produce viable lambs under those conditions. The breed average is 173% lamb crop in Britain. 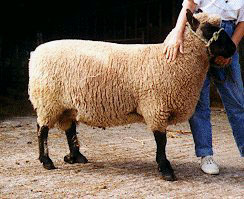 It is normal practice for breeders to put their ewe lambs to the ram and 60% to 80% of them will rear a lamb as hoggets. The ewe will continue until she is seven or eight years old and even as high as twelve years. The Clun fleece is a short, close-textured wool of consistently high quality, with a spinning count of 58 and a high degree of elasticity. It is largely used in hosiery and knitting yarns. The Clun Forest should also have a long, clean face of dark brown color, free from wrinkles. Ears of short to medium length, set well on top of the head. Bold, bright eyes. Top of head nicely covered; free from dark or black wool. In 1970, Tony Turner imported into Nova Scotia 40 Clun ewes and two rams from the Ray Williams flock in Shropshire. That effectively marks the beginning of the Clun Forest breed in North America. Progeny from that importation was first available to buyers in 1973. Since then Angus Rouse from Debert, Nova Scotia, imported a ram and four ewes from the Pen Y Wern flock (A.E. Williams & Son) in 1977, and then nine years later, he brought in two more rams and two ewes from the flock of Ivor Owens. These last sheep were released from quarantine in 1993. In 1974, six breeders met in Harrisburg, PA, to organize the North American Clun Forest Association. Some of the first actions of the Association were intended to maintain and strengthen the traditional virtues of the breed: e.g., to keep breeders focused on the productive characteristics of the breed rather than a particular kind of appearance, no Cluns are permitted to be shown competitively. In the years since the founding of the NACFA, Cluns have quietly spread from Nova Scotia to British Columbia and from Vermont to Oregon. They've proved remarkably adaptable--to Minnesota's cold climate weather, the desert heat of Utah, or the constant humidity of Hawaii. Because of their characteristic ease of lambing, mothering ability, lamb vitality, and eagerness to forage, Cluns are proving to be the breed, developed in the 18th and 19th century, which is particularly suited for the grass-based livestock production systems of the 21st century. you would see a automatic slide viewer. Mason, I.L. 1988. World Dictionary of Livestock Breeds. Third Edition. C.A.B International. 348 pp.